Designed during the first months of World War II, the Canol Pipeline brought oil from Norman Wells near the Mackenzie River to Whitehorse, Yukon Territory. Once the oil was refined, it would be sent to Alaska via pipeline to ensure that the Japanese navy could not intercept any transport. The oil deposits at Norman Wells were discovered by the explorer Alexander Mackenzie during the 18th century. In January of 1942, Lieutenant General Brehon Somervell, commanding general of the Army Service Forces, ordered James H. Graham, former dean of engineering at the University of Kentucky, to investigate the possibility of harvesting oil from Norman Wells. On April 29, 1942, General Somervell immediately approved the recommendation of Dean Graham to implement a pipeline from Norman Wells to Whitehorse (O'Brien, 1970). The construction began in 1942 and was completed in 1944 by the United States Army. 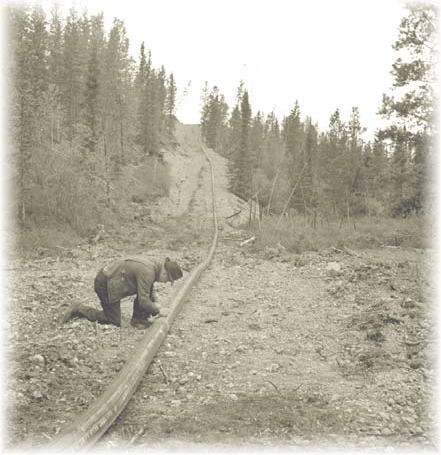 A road was also constructed alongside the Canol pipeline during this time. In 1945, soon after the completion of the Canol Pipeline, the volume of crude oil that was able to be transported compared to the cost of operating the pipeline could not be justified. The Canol Pipeline was shut down and abandoned in 1945 (Wilson, 1991). O'Brien, C. F. (1970). The Canol Project: A Study in Emergency Military Planning. The Pacific Northwest Quarterly, 101-108. Wilson, W. H. (1991). Review: A Walk on teh Canol Road: Exploring the First Major Northern Pipeline. The Pacific Northwest Quarterly, 114. References: "Life in Norman Wells." Normanwells. 2010. Accessed May 03, 2017. http://www.normanwells.com/lifestyle/life-norman-wells. Quenneville, Guy. "Imperial Oil to suspend Norman Wells production due to continuing pipeline shutdown." CBCnews. January 26, 2017. Accessed May 03, 2017. http://www.cbc.ca/news/canada/north/imperial-oil-norman-wells-suspend-production-pipeline-1.3954051. Sir Alexander Mackenzie was a Scottish man famous for his North American expeditions. Mackenzie was a fur trader and explorer, who originally resided at the North West Company trading post. Mackenzie is famous for believing in the existence of the Northwest Passage, an Alaskan canal that would link the Atlantic and Pacific Oceans. The Northwest Passage would provide opportunities for trade (PBS). In 1789, Mackenzie organized a crew of French-Canadian explorers and Native American interpreters to travel by canoe from Fort Chipewyan in search for the Northwest Passage. This expedition helped to create records of the northern parts of North America in the Arctic, rather than prove the existence of a Northwest Passage. In 1973, Mackenzie led a second voyage from Fort Fork along the Peace River. Mackenzie’s crew crossed the Rocky Mountains to the Fraser River. Mackenzie relied on Native Americans for support and guidance throughout his travels. Shuswap Indians warned the crew of the dangers of the river, causing Mackenzie’s crew to take a shorter route overland (CBC). Mackenzie’s party eventually reached the Pacific Ocean and encountered the Bella Coola Indians, who were upset about the presence of Mackenzie’s crew. Despite the concern of an attack from the Bella Coola Indians, Mackenzie became the first European to cross the North American continent north of Mexico on land. Lewis and Clark did not reach the coast until 1805(PBS). King George III knighted Alexander Mackenzie in 1802 for his efforts and success in traversing the North American continent. "Alexander Mackenzie-From Canada, by Land." CBCnews. Accessed April 09, 2017. http://www.cbc.ca/history/EPCONTENTSE1EP6CH3PA4LE.html. "Empire of the Bay: Alexander Mackenzie." PBS. Accessed April 09, 2017. http://www.pbs.org/empireofthebay/profiles/mackenzie.html.